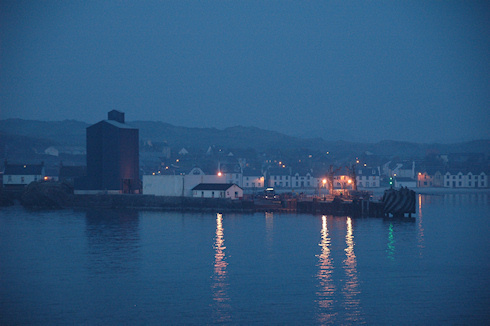 Business cases for infrastructure improvements to Port Ellen and Kennacraig were presented to The Scottish Government in March 2009 with a variety of options recommended as minimum and maximum work plans. £3.4M is now being made available for CMAL to rebuild the pier and carry out fendering works at Port Ellen. Meanwhile approximately £1.5M will be set aside for the removal of a sunken barge at the entrance to Kennacraig Harbour, work which is expected to get underway this summer. Subject to this and some minor modifications, the new £24.5M Islay ferry, MV Finlaggan, will be able to use the existing pier at Kennacraig when she comes into service next Spring and will serve Port Askaig. One of the existing vessels will continue to serve Port Ellen. The full redevelopment of Port Ellen and Kennacraig was outlined in the business cases at a cost of £16M and £17.8M respectively and cannot be undertaken at this time due to the current financial climate and pressure on public funds. In summary the most basic repairs are going to be made to keep it running, but this still seems to leave everything on rather shaky foundations. The Finlaggan will use Port Askaig only and possibly not run when the weather for Port Askaig is unsuitable. The Hebridean Isles or the Isle of Arran will continue to use Port Ellen, but be diverted to Port Askaig in bad weather. Will the Hebridean Isles (or the Isle of Arran, depending on which one becomes the ‘spare’ boat) also be the only Islay ferry should Port Askaig be blocked? I'm sure this won't be the last we hear of it and further questions will be raised, on Islay and elsewhere.